Want to create buzz and get the word out to the right people? 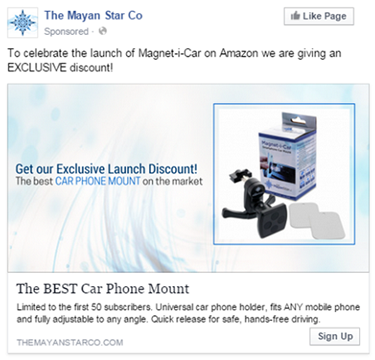 Facebook is a great way to promote the launch of a product or service and generate excitement. To be successful, you need to plan your content, write your posts and make good use of the tools Facebook has to offer. 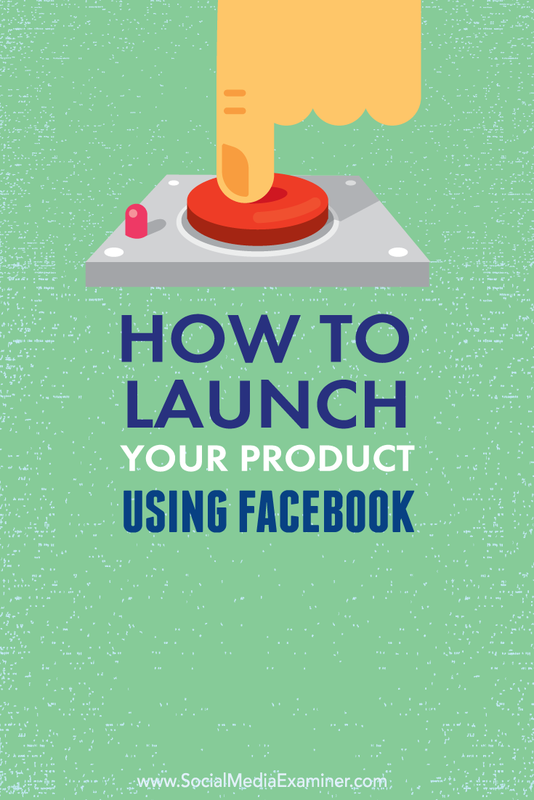 In this article you’ll discover how to launch a product or service using Facebook. You’ll want to map out your launch strategy at least two months ahead, and most likely even earlier than that. Plan what types of launch material you’ll have available to share on social media to get the buzz going. You may also need to start designing some of these materials. 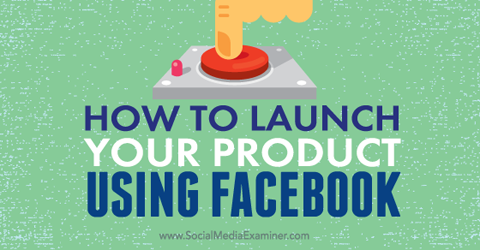 Discover how to launch your product using Facebook. Images and infographics: Think about designing several versions of your images so they’re size-optimized for each social site. Also, if you’ll be using them in a Facebook ad, make sure the images are 1200 x 628 pixels and comply with the 20% text rule. Free ebooks, reports or white papers: These freebies could be part of your final product or something valuable that will promote the final product. Free webinar or other educational content: If you’re launching an online product, you may want to host a webinar, telesummit or some other type of live event. Plan when that event will occur and when you’ll start promoting it. Sale or discount period: If you’re offering an introductory price, figure out how long that will last and how many posts you might have around that promotion. Facebook contests: If you’re having a contest to promote the launch or new product, plan the timing and determine what type of contest will work best for you. When launching a course, for example, you might plan all of the content and decide when you’ll communicate about it to people on your email list and in your social media posts. 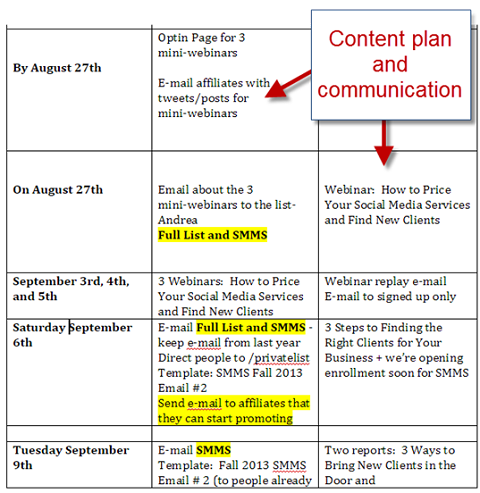 Plan when each piece of content will be released to your email list and what posts will go out to Facebook. If affiliates or promotion partners will be helping you get the word out about your product or service, start assembling that team and putting together resources for the team to use. Be sure to make it easy for affiliates to build buzz on Facebook and other social media channels. Write a variety of Facebook posts and tweets so they can either cut and paste them or have a great starting place to add their own wording. 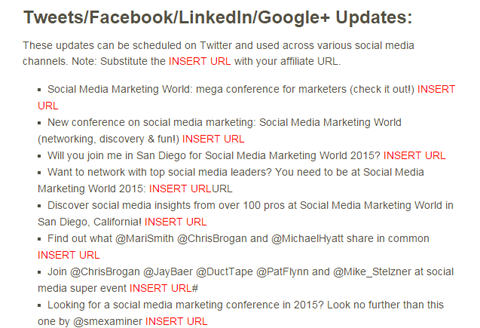 Social Media Examiner provided a variety of images to their affiliates to help promote Social Media Marketing World. 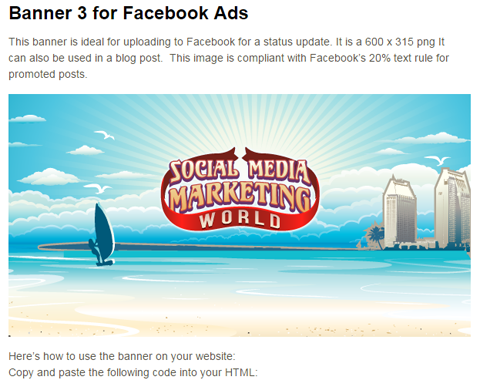 Some of the images were appropriate for Facebook ads, while others were useful for tweets or blog posts. Develop images to use for Facebook ads and share them with affiliates and partners. They also provided a variety of tweets and Facebook updates that were ready to use, and people just had to add their affiliate link. Write a variety of social media posts for you and your affiliates to use. 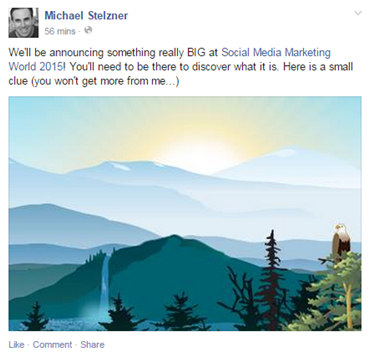 To start building buzz and generating excitement around your product or service, post teasers about it. If appropriate, use both your Facebook page and profile to let your Facebook fans and personal friends know that something is coming. Add intrigue and consider using your personal profile to post about it. 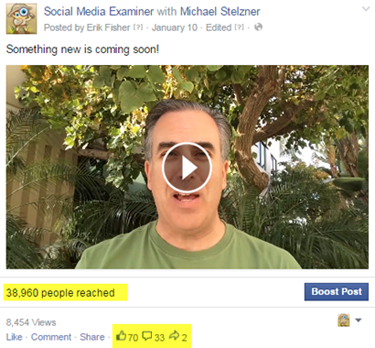 Using video on Facebook to promote your launch will go further in the news feed. Make sure you’re creating a variety of content. You can see that this video post reached nearly 39,000 people and had over 8,000 views. Use video to build buzz. You can also give people a sneak peek into your process. 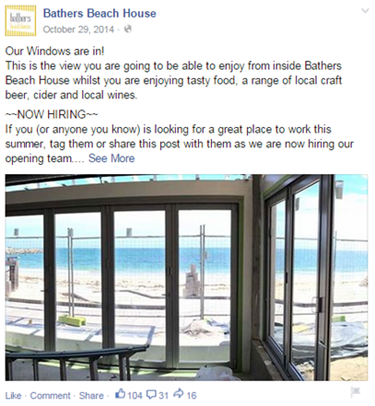 Bathers Beach House in Australia started posting about their restaurant months before it opened. They shared the building process, gained the interest of potential diners and grew to over 4,000 fans before they even opened their doors. This led to a successful opening of their restaurant, and they continue to have high engagement and interaction. Show the process behind your product or service launch. If you have affiliates or promotional partners, consider co-creating material to launch the product, such as a webinar or live Q&A session. 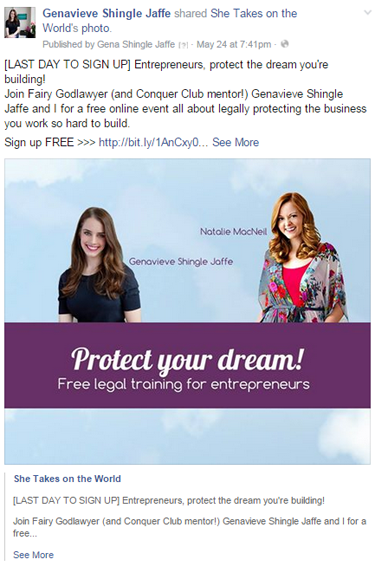 Gena Shingle Jaffe launched a legal course for entrepreneurs, and Natalie MacNeil had a perfect audience for the course. They co-created a webinar to give the audience some good tips and promote the online course. Consider co-creating promotional material with your affiliates. Your launch phase may vary in length and never be truly over in terms of promotion, but you likely will have an end date for the biggest promotional push. Figure out what types of things you can do to keep the excitement going. 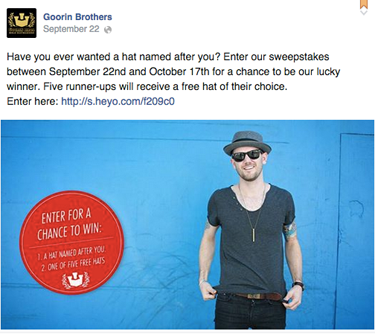 A Facebook contest is a perfect fit for continued promotion. Goorin Brothers, a boutique hat designer, launched a new hat and decided to involve their audience by naming the hat after one lucky winner. In addition they gave away five custom hats to the runner-ups. They spent $70 on Facebook ads and $30 on the Heyo app. The contest got 8,404 email entries and built up a lot of awareness around their hats and their brand. Find creative ways to involve your audience in your promotion. You also need to have a Facebook ad plan as part of your launch strategy. Consider focusing much of your ad budget on the pre-launch phase where you give away valuable content. But if you have a coupon or something special to offer, you can promote that with an ad campaign as well. Use Facebook ads to get your message out to a wider audience. After the launch is over, make sure you thank your audience and your affiliate and promotional partners, and tell people what’s next. Let your audience know that they’re appreciated even if they didn’t buy from you. Thank your audience after your launch. You also want look at your analytics and do a little research on which techniques worked the best for you. Did the webinar you held convert the most sales, or was it something else? Where did your new subscribers come from and which social site drove the most sales? Learn from this launch so you can improve the next one. Facebook can be a great place to get the word out about your new product or service. And affiliates can help you make it look like everyone is talking about your product. To do your launch right on Facebook and help your affiliates sell, keep the key points in this article in mind. What do you think? Have you used a technique on Facebook that has helped you sell a product or service? Share your thoughts with us in the comments below! 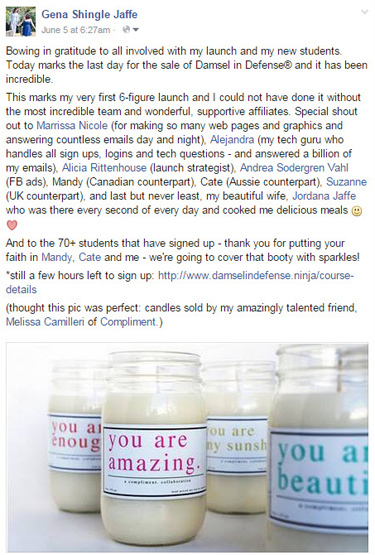 Tips for launching your product using Facebook.